FloorSweep™ Floor Sweeping Compound: made & sold by Charlotte, NC based Floor Sweep, Inc.
FloorSweep, a manufacturer and wholesale only supplier, has been serving the sweeping compound needs of US industrial distributors from the East Coast to the West Coast, Mexico and Canada for over 50 years. We are considered an industry leader for our commitment to superior quality, reliable service and prompt delivery of our products at the lowest prices. 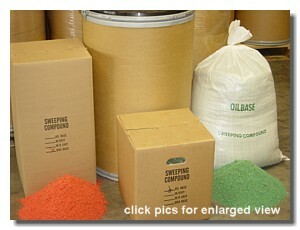 Commonly termed “DustDown”, our environmentally safe absorbents help preserve and protect the work environment. Applied to most any surface, FloorSweep™ controls dust and dirt as it sweeps, while helping sanitize your floor surface with a pleasant pine scent and is guaranteed not to dry out. 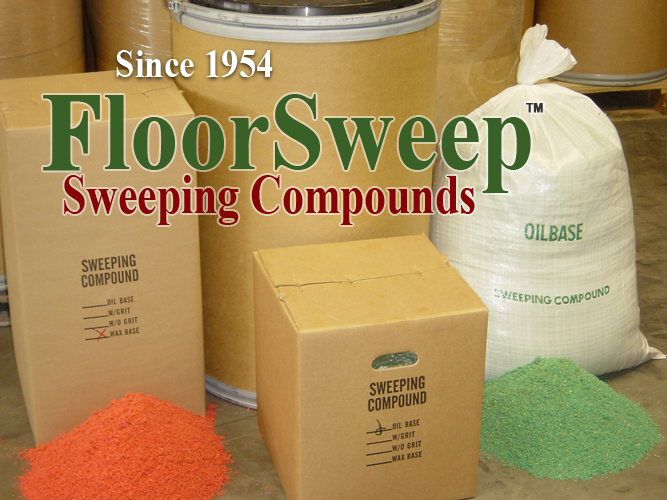 Remember when you think of sweeping compounds, there is only one FloorSweep™! How Can We Get Your Products? HOME | ABOUT US | PRODUCTS | PACKAGING | HOW TO ORDER | FAQs | CONTACT INFO.